So how's everyone's 2011 shaping up so far? Is everyone still good on their resolutions and goals? I got 101 of 'em, and so far, so good (ie. no failures yet). Well, after several weeks of American-food blogging, I'm glad to return to Korean food! 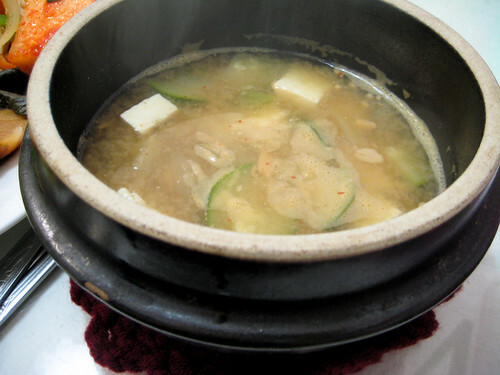 And what could be more fitting for the first food post of 2011 than a steaming bowl of tteokguk? You did eat your tteokguk, right? Good. Because no Korean New Year's Day is complete without it. 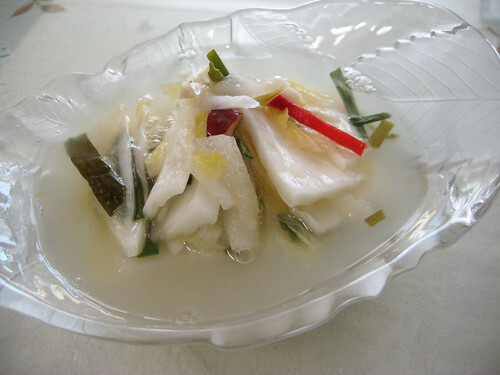 For those in the unawares, this is a traditional Korean thick soup made with chewy, dense slices of white rice cake. 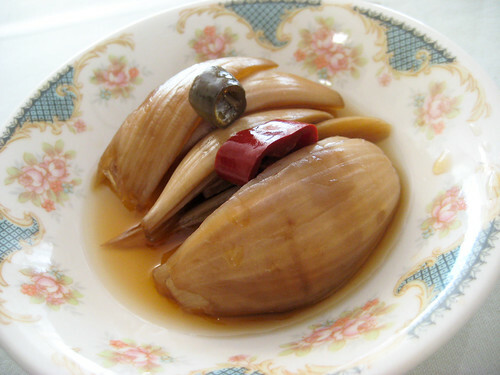 Although people eat this year round (typically in the winter), it's specifically eaten on January 1st, as well as Lunar New Year's day. 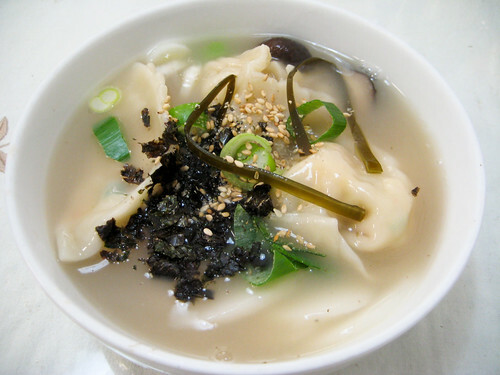 Honestly, growing up, I couldn't stand tteokguk. I had an aversion to the rice cake texture because it felt like chewing on rubber. I'm sure some of you know what I'm talkin' about. 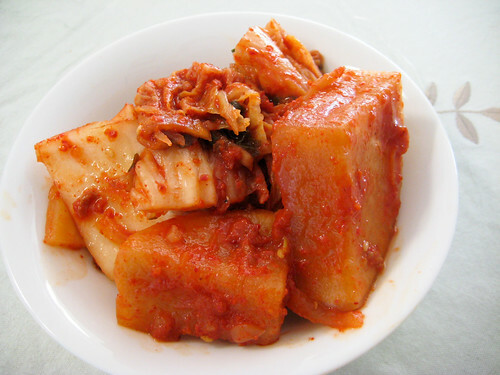 However, as an adult, I've started warming up to this dish (no pun intended), and now I really appreciate the stick-to-your-ribs rice cake chunks and the comforting flavors. 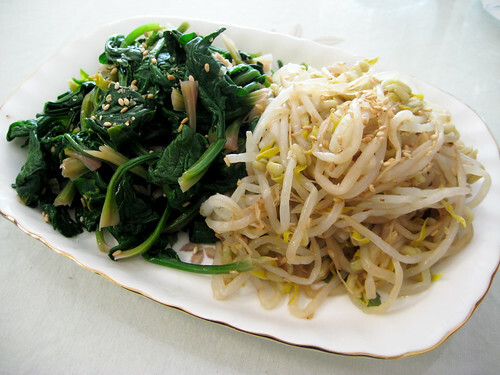 Since I was in Cheonan for NYE (no crazy celebrations in Seoul this year...), I took the opportunity to finally learn how to make my own vegan version of this traditional dish. And I'm happy to share the recipe with you! First things first: you gotta make the vegan soup stock. Normally, people add all sorts of animals bits, like dried anchovies or dried shrimp to flavor the stock, but those can just be eliminated and it will still turn out delicious, trust me. 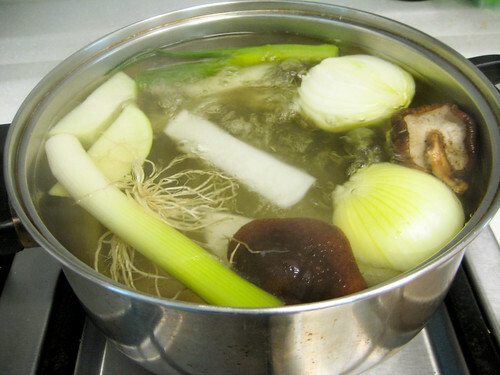 Place everything in a pot and bring to a boil. 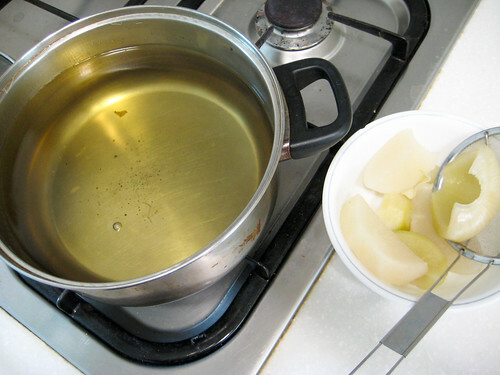 Once the water has been boiling for a few minutes, remove the kelp, and continue to boil everything for about 30-45 minutes. 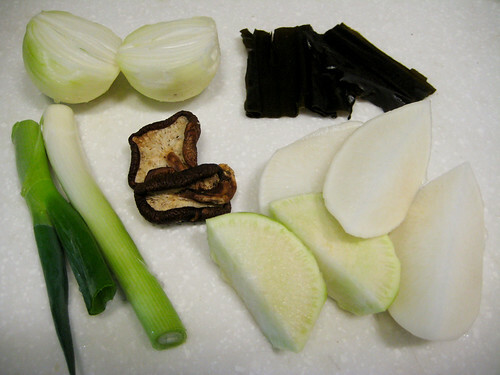 After, remove all the chunks, and you will be left with some very flavorful broth for all your jjigyes. 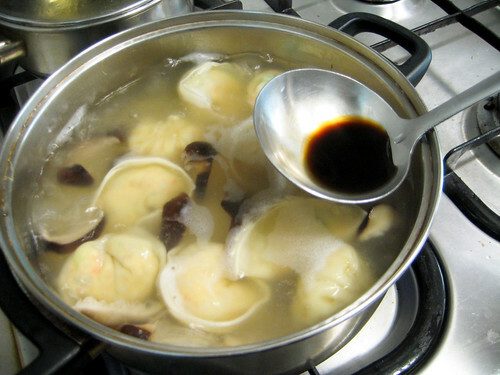 Once you have some stock, you're ready to make your tteokguk! 1. Soak the tteok slices for about 30 minutes til' it gets a little soft. 2. 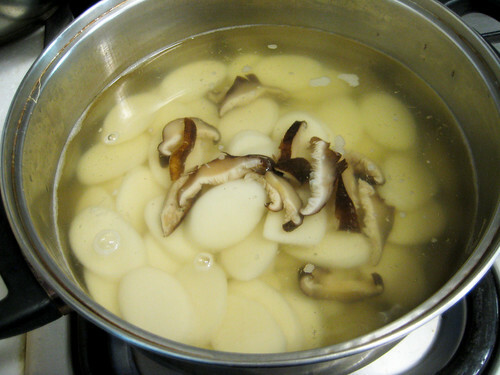 Add your soup stock to a large pot, along with the ddeok slices and mushrooms, and bring to a boil. 3. 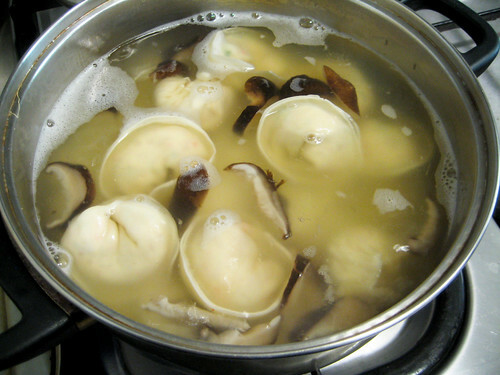 Once it is boiling, add mandu (if using). 4. Add soy sauce. Taste the broth to see if it needs more. You can add more soy sauce, or just some salt, to taste. 5. Add half of the chopped green onion. Stir everything gently, making sure the tteok slices don't stick to the bottom of the pot. 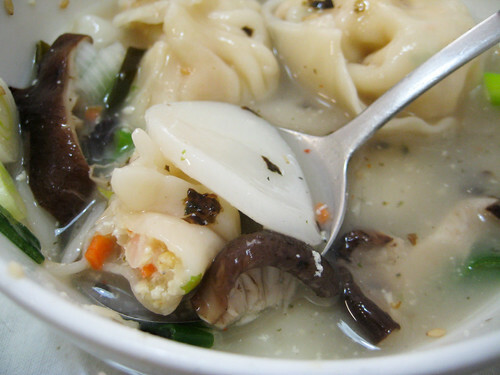 The soup should start to get a little thick from the tteok. 6. 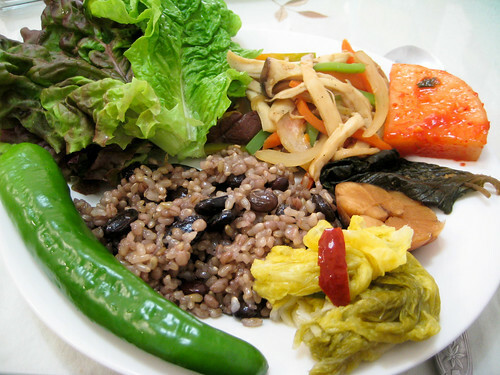 Try one of the tteok pieces to make sure it is soft all the way through. 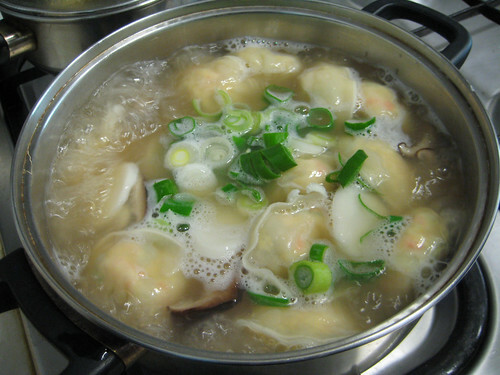 Once the tteok is cooked and the mandu is floating, it will be done. 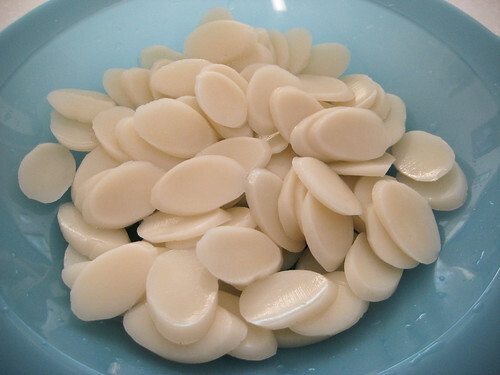 The tteok slices are deceivingly filling- just a little bowl of this stuff will fill you right up! 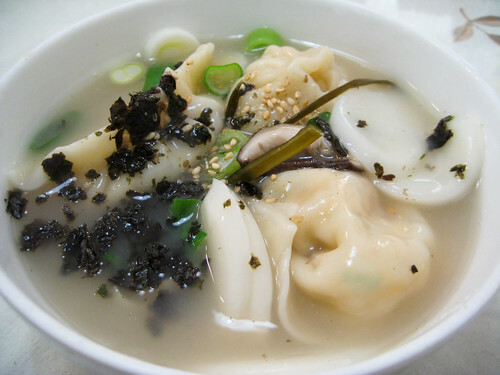 To round out your New Year's Day meal, enjoy your tteokguk along with plenty of banchan, totally animal-free ofcourse. There's something about making mandu that makes me feel all warm and fuzzy inside. It's such a great family-bonding activity, where everyone can get involved. Even my dad got in on the action! 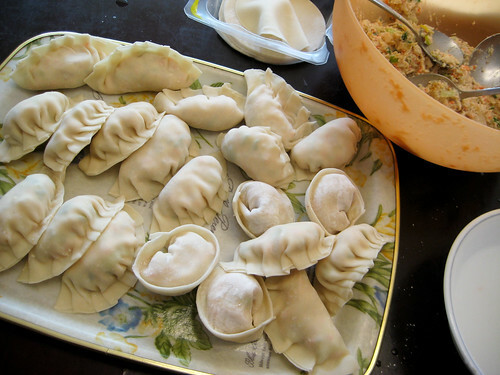 :) His mandu looked like bear claws in the beginning, but he made stark improvements by the end. 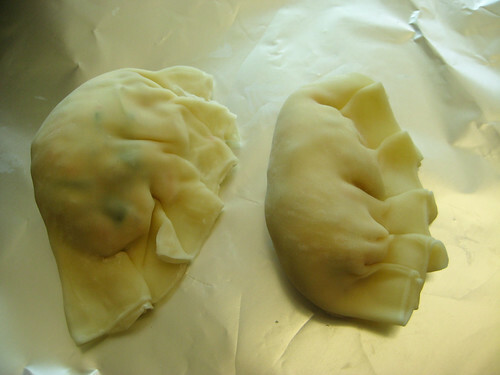 Just check out the difference between his first and last mandu! 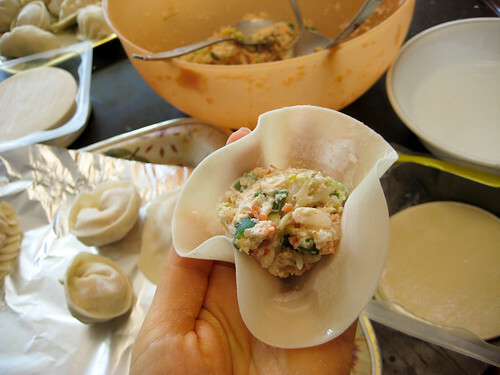 But really, it doesn't matter what the mandu looks like cuz in the end, it will still taste delish. 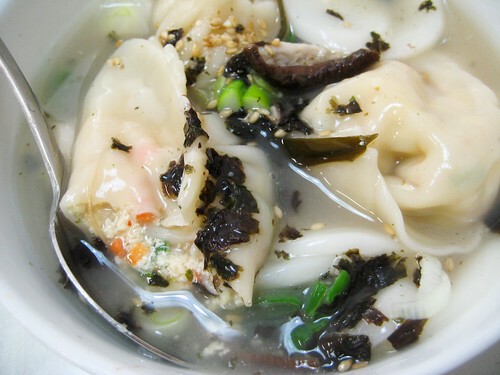 We formed our mandu in two different shapes, the half-moon shapes for pan-frying, and the round ones for soups or steaming. ... and vegan kimchi. My fridge is currently packed almost entirely with containers of this spicy red deliciousness. 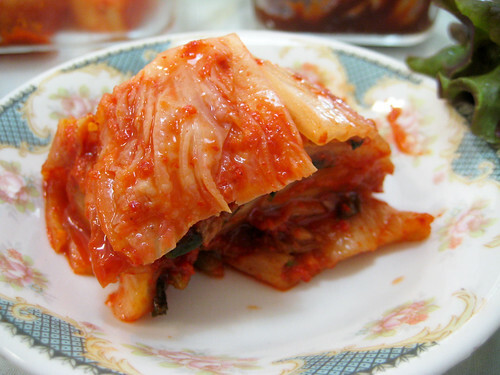 :) I'm kimchi-rich. Cha-ching! 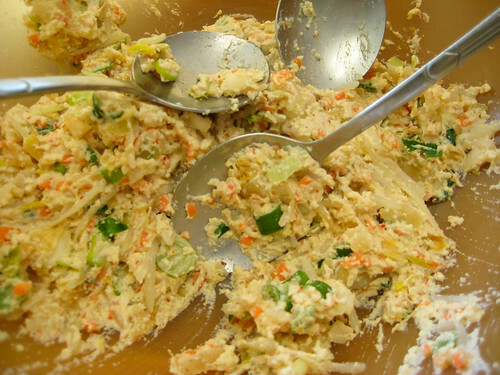 Question of the day: What did you eat on New Year's Day? Any traditional meals?